Tonight I came home from work and was quite hungry when I walked in the door. By the time I made it into the kitchen to prepare dinner I was ready to eat. Now. I wanted something fresh, something healthy, and, of course, something delicious. I decided upon making a papaya salad boat by slicing a papaya in half, scooping out the seeds, and filling each half with a salad mixture. I first mixed up a salad mixture by pulling together some ingredients I had on hand that I thought would go well together: black beans, red pepper, avocado, tomatoes, lime juice, agave nectar, ginger, cilantro, and mint. Once I was satisfied with the flavors of the salad mixture, I went to grab one of the papayas … and discovered that not a one of them had yet ripened. D’oh! “What now?” I asked myself as I drummed my fingers on the counter top and mulled my culinary condundrum. That’s when I decided to stick to my guns and still use the papaya. 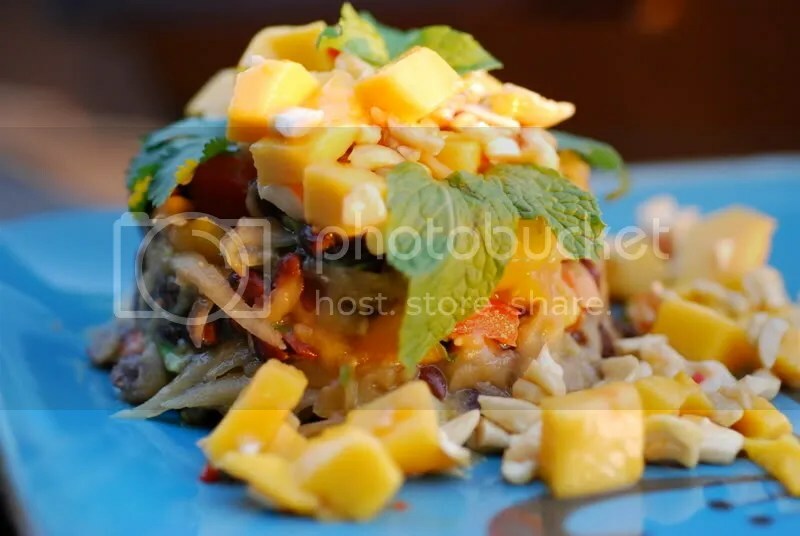 I pulled my box grater off the shelf and grated the papaya into the salad mixture and I was then on my way towards creating my interpretation of a green papaya salad. To compliment the papaya salad I made a mango “salsa” to top it with with the flavors of cashew, sesame oil, and chili garlic sauce. What I ended up with was exactly what I had been hoping for when I walked into the kitchen: something fresh, healthy, and packed with flavor. 1. Using the large holes on a box grater, grate an unripe papaya into a medium bowl. 2. Mix in all ingredients from the black beans through to the mint. Stir well to combine. 3. 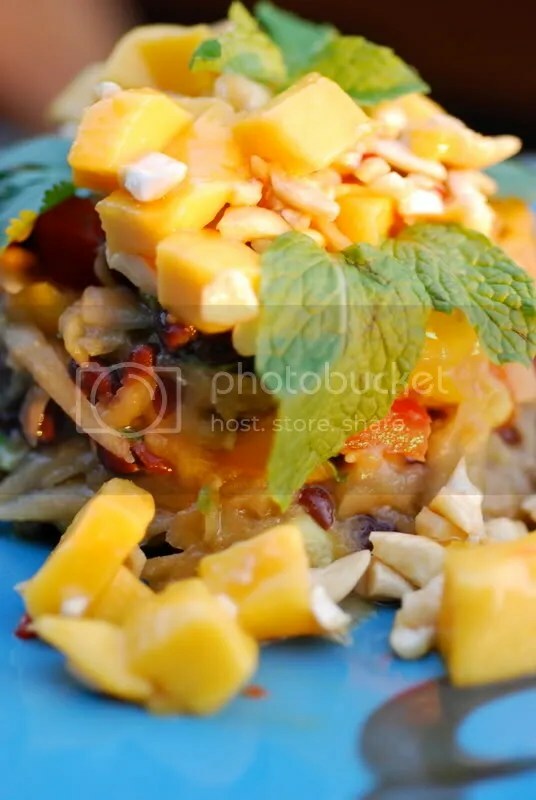 Mix the mango, cashews, oil, chili garlic sauce, and salt in a separate bowl. 4. To plate: fill a small ramekin (or other similar vessel) with half of the papaya mixture and turn out onto a plate. 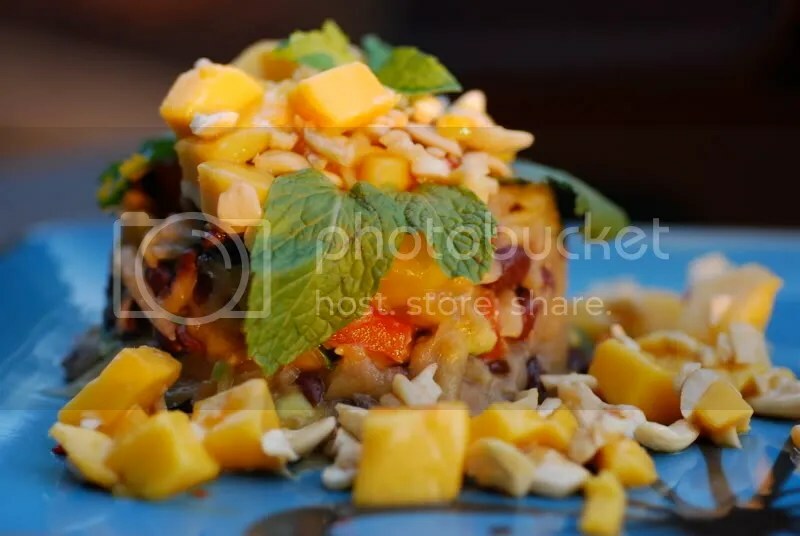 Top the papaya mixture with half of the mango mixture. Garnish with cilantro and mint. Repeat for the second serving and enjoy! 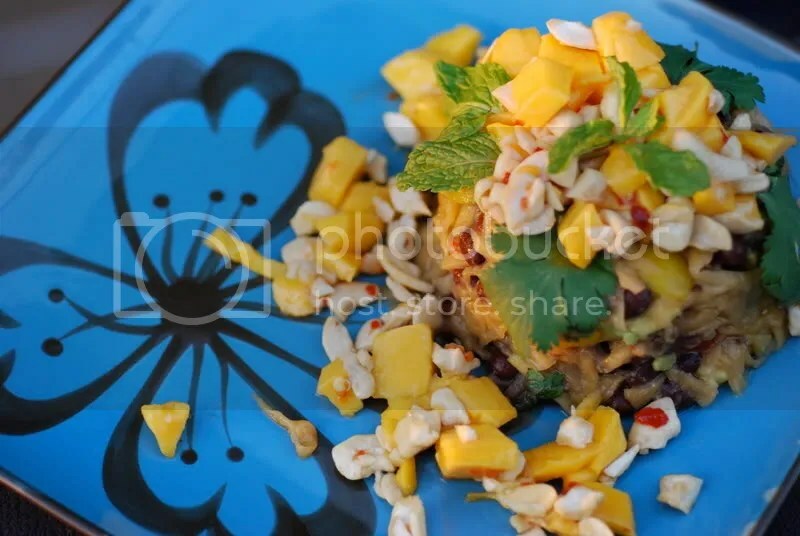 This looks so wonderfully scrumptious…fresh and filled with a wide variety of delicious flavors. Thanks for sharing! Erin – I share those same PA palates and mine can handle this one just fine!